CICS VSAM Recovery Version 4.2 (CICS VR) can help you to recover CICS and batch VSAM data from physical or logical corruption. CICS VR allows you to recover from errors quickly, reduces the risk that off-line processing might exceed its batch window, and improves the availability of your online CICS systems. -- Invoke the backup process from the CICS VR panel interface to allow both sharp and fuzzy backups (when enabled). -- Pre-allocate the target data set prior to restoring from a backup. -- Manage authorization for the panel interface to limit access to specific tasks by user ID. -- Test forward recovery and backout procedures to enable testing of recovery processes without affecting production data. -- Create disaster recovery reports to allow customers to review and validate what is needed at a remote site. 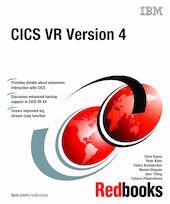 This IBM Redbooks publication reviews how to install, customize, and implement CICS VR in your environment. It also looks at usage scenarios and new functions that are available with CICS VR 4.2.